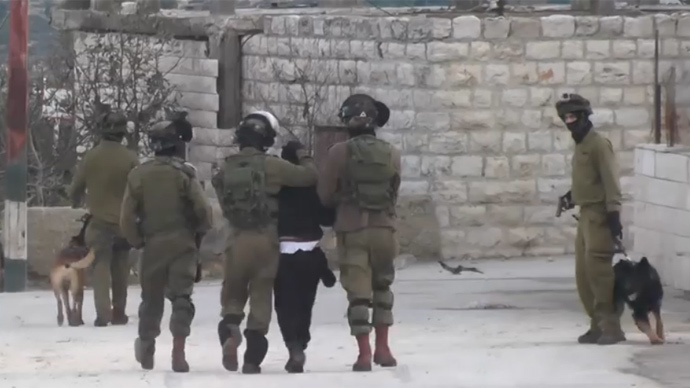 A leaked video shot in December purportedly shows IDF soldiers setting dogs on a Palestinian teenager. The Palestinian Ministry of Foreign Affairs condemned the attack, while Israel's chief military prosecutor ordered an investigation into the incident. The video went viral after being posted to Facebook by former ultra nationalist Knesset member Michael Ben-Ari with the caption: “The soldiers taught the little terrorist a lesson.” The video has since been removed, but several copies were shared on the internet. The Palestinian WAFA news agency reported that the attack took place on December 23, 2014 in the 'buffer zone' in the West Bank, between the town of Beit Ummar and the nearby Israeli settlement of Carmei Tzur, which is located south of the town. The footage shows 16-year old Hamzeh Abu Hashem crying out as a dog repeatedly attacks him, while Israeli soldiers hold him down. A man can be heard commanding the dog to “bite him” as well as tauntingly asking “who’s chicken?” according to a translation provided by Haaretz. Military Advocate General Major General Danny Efroni has ordered for the soldiers involved to be interrogated, Channel 10 reported. Hashem’s father is cited by Haaretz as saying that the teen was treated for dog bites at a hospital before being transferred to a prison. “We, his mother and I, watched the video, and we couldn’t believe what we were seeing,” he said. “My wife almost fainted. I don’t know if there’s a mother or father in the world who can be indifferent to such pictures. Israeli human rights group B’Tselem however says the footage doesn’t show anything out of the ordinary, noting that it is “standard” army practice. The group documented several similar incidents over last year. A projects coordinator for Breaking the Silence, a former IDF soldier leftwing organization, has condemned the attacks but confirmed that such incidents are not unusual. “While you are a part of the army, those kind of events happen. It’s not unusual. When you use an army to control a population, when you create an occupation, that’s the kind of reality that comes out,” Achiya Schatz told RT. He also said that he had little hope that the investigation would lead to any changes to army procedure. Schatz said in this case the dog was not merely used to restrain a criminal but rather as a weapon to breed fear. “This specific dog is an attack dog. It’s trained to attack. Here we see a dog used against a 16 year old kid. What you see here isn’t the dog being used to restrain but the dog being used to terrify,” he said.